Arturo Vega, “Ramones” banner, acrylic on canvas, c. 1978. Collection of Jade Dellinger. A three-year project nears completion, as the Queens Museum prepares to open “Hey! Ho! Let’s Go: Ramones and the Birth of Punk,” curated by Gallery 98’s Marc H. Miller. The opening, on Sunday, April 10, is now only ten days away. The exhibition tells the Ramones’ story from beginning to end, while simultaneously emphasizing the band’s relationship with the world of visual art. In the 1970s, as young musicians rebelled against the tedious progressive rock on the radio, so did young artists resist the cerebral art that filled New York galleries. An accidental encounter, in the stairwell of his East Second Street loft, introduced artist Arturo Vega to Dee Dee Ramone, and set him on his path. For the next twenty-one years, Vega would devote himself as the Ramones’ art director, designing their stage sets, lighting, and merchandise. The Queens Museum exhibition includes a twenty-foot banner, hand-painted by Vega, that hung behind the Ramones at concerts in the late ’70s. Though Vega spent much of his time on the road, he maintained contact with the New York art crowd, and continued to make fine art paintings. 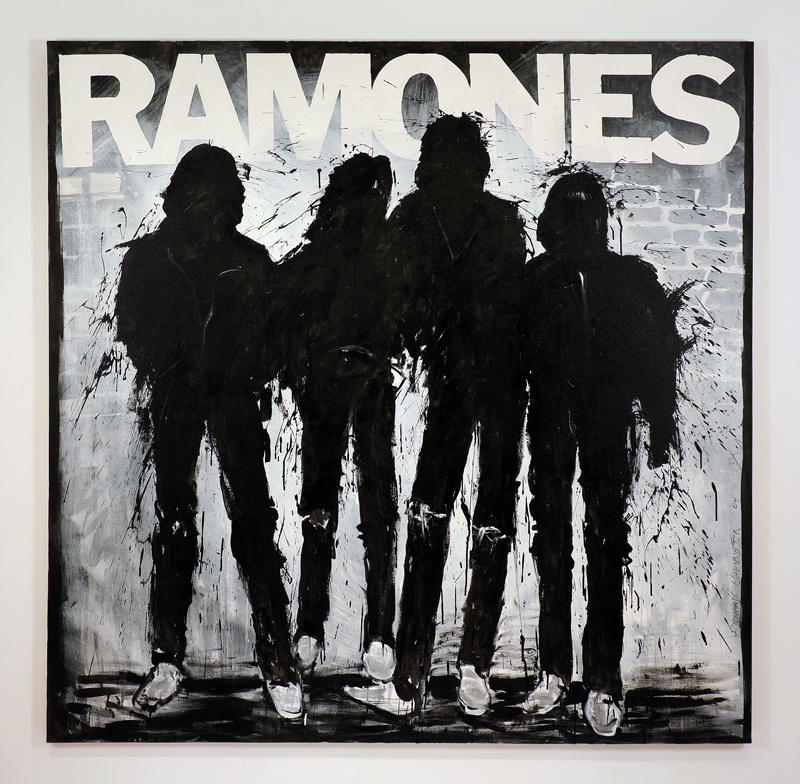 His friendship with Richard Hambleton led to an extraordinary collaborative effort: a painting initiated by Vega and completed by Hambleton, based on the cover of the Ramones’ first album. The Ramones’ poses, famously captured on camera by Roberta Bayley, are re-envisioned in the signature “Shadowman” style that Hambleton used for paintings done directly on the streets of the East Village. As you wait for the Ramones show to open, you can learn more about Arturo Vega (1947–2013). Tonight at 7 p.m., for the closing of the exhibition “Arturo Vega: Insults” at Howl! Happening Gallery, 6 East 1st Street, Punk magazine co-founder Legs McNeil will speak about his late artist friend. Richard Hambleton and Arturo Vega, Ramones, acrylic on canvas, 2004. Collection of the Estate of Arturo Vega.